Earlier today, I found myself reading a few of my earlier posts here on the Happy Holly Project. I reread my original post. And I reread some of my … well all of my … New Years Resolution posts. The first one in 2012 for 2013. And I found myself wishing I could do some New Years Resolutions today. Somewhere near the end of April. 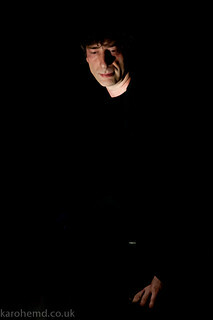 Neil Gaiman being brilliant (Photo credit: karohemd)After all, I’ve had enough time to try those other dismal ones on for size.I have made some mistakes … BIG mistakes … courtesy of blindly following Neil Gaiman’s advice.And I’ve lost a few pounds courtesy of eating a smidge healthier. I’ve also fallen down dismally in the “Holly Gets A Great Job” arena although I’ve not talked about that much here. Oh, and then there is the “Holly Succeeds Outrageously Utilizing Online Dating”. And how’s THAT working for you, Mrs. Holdren? Okay, so everything has not fallen into place as I’d hoped. But still, hope springs eternal in the hearts of we wearers of Rose Colored Glasses, no? So when I came upon this article in the Elephant Journal, it struck me that Resolutions, like many other things, are not merely limited to the last calendar day of the year … or the first of the new year … or even, as I sometimes do, on my Birthday. Actually it is more like my half birthday than anything. At any rate, I thought these suggestions … resolutions, if you will … were absolutely excellent. Far better than anything I could come up with. At least anything I could come up with today. So without further ado … let me present the things you can Start Now. Even if you think it’s too late, it’s not. Spend time with the right people. These people come few and far between, but once they are in your life, they will stay there forever. These are the people you enjoy, who love and understand you. They are the ones who make you feel more alive and not only embrace who you are now, but who you want to become. The most important thing that my mother has ever taught me (besides if you think it’s too much eyeliner, it is) is that it isn’t your problems that define you—it’s how you react to them. I used to be the one to bury my head in the sand if a problem arose, but quickly learned that problems do not go away until you find a way to take care of them. Be honest with yourself—about everything. Be honest about what’s right, as well as what needs to be changed. Be honest about what you want to achieve and who you want to become. My dear friend once told me that once you become complacent, you no longer strive to be better. If you are truly unhappy, or even just complacent, change. Make your own happiness a priority. This can be the hardest goal to carry out because there is a common misconception that you can’t please everyone. Remember, it is possible to take care of your own needs while simultaneously caring for those around you. And once your needs are met, you will likely be far more capable of helping those who need you most. It takes a lifetime to fully get to know yourself, so start as soon as possible. Trying to be someone else is a waste of the person that you are. Embrace your own ideas, strengths and beauty. Right now is a miracle. Right now is the only moment guaranteed to you. Right now is life. Stop thinking about how things could have been because you are here, right now, for a reason. Value the lessons that mistakes teach you. If you’re not failing from time to time, you’re not trying hard enough. Take risks, stumble, fall, but most importantly, get up, take responsibility and try again. Give your ideas and dreams a chance. Either you succeed or you learn something. You will never know if you never try. Cheer the victories of others. Be happy for others making progress. Be thankful for their blessings and let them know. What goes around comes around and pretty soon, they will be cheering you on. Look for the small glimmers of hope in a rough situation and remind yourself of all the things in your life that are right. Focus on what you have, not what you don’t. Notice the beauty of small moments. Instead of focusing on the big things, like marriage, kids or a big promotion, find happiness in the small things that happen every single day – the quiet cup of coffee in the morning, the book you can’t put down, holding hands. Experiencing pain because of your actions or the actions of others is normal – it means you’re human; however, if you hold on to this pain, you will never be able to move on and grow. Forgiveness is key. It doesn’t mean you’re erasing the past or forgetting what happened, it means you’re letting go of the resentment and pain and instead choosing to learn and move on. Actively nourish your important relationships. Bring real, honest joy into your life and the lives of those you love by simply telling them how much they mean to you on a regular basis. Decide who these people are and treat them like royalty. Do not take them for granted. Notice how wealthy you are—right now. As Henry David Thoreau said, “Wealth is the ability to fully experience life.” Even when times are tough, it’s always important to keep things in perspective. I woke up this morning with a roof over my head. I have a choice in what religion I want to practice, what job I want to do and who I want to love. I have clean drinking water and medical care. I can read and I have an education. Some would say I am incredibly wealthy. No matter how busy you are, find time to help others in need. It could be as simple as giving a bottle of water to a homeless person on the side of the road or traveling to a foreign country to lend a helping hand. Do what you can. After some soul-searching and introspection, I’ve decided to make these goals my priority in life, and I hope you do too. via Start Now. ~ Christina Chastain | elephant journal.